Port Elizabeth - The IRONMAN African Championship was off to a spectacular start early on Sunday morning at Nelson Mandela Bay’s Hobie Beach. The cannon sounded at 06:30 after which the top PRO male athletes entered the water. The swim covered a distance of 1.6km at a temperature of 18.5 degrees Celsius. The swim was reduced from 3.8kms due to the rough sea conditions and large swells. The first PRO male athlete out of the water was Australian Josh Amberger, who took the lead from the start, clocking his swim at an amazing 24:59. England's Tim Don, 'The Halo man', came out a close second (+00:32). In third place out the water was South Africa's Kyle Buckingham (+00:41). England's Lucy Charles-Barclay was the first PRO female athlete out of the water with a stunning swim time of 25:20. The USA's Lauren Brandon was hot on Charles’ heels, second out of the water (+00:01), with Anja Ippach from Germany getting out the water 04:14 after Brandon. Flying the South African flag in fourth was Annah Watkinson at a time of (+06:03). At the 51km mark of the cycle, the PRO men looked comfortable on their bikes and paced themselves through the ups and down of the route. American Ben Hoffman had a total race time of 01:38:36 at the 51km mark. Amberger (+00:09), Spain's Eneko Llanos (+00:10) and Buckingham (+00:12) were fighting for to gain a lead on one another. In the PRO women’s race, Brandon crossed the 51km mark in first position with a time of 01:48:03, taking the lead from Charles-Barclay, who followed in second position (+00:02) and Ippach in third at 01:50:52. The wind started picking up, pushing against the PRO men who were coming back from their first loop. At the 118km mark, Hoffman slipped down to third position after being overtaken by German uber biker, Andreas Dreitz - who had a cycle time of 03:19:33, who was closely followed by fellow countryman, Maurice Clavel (+00:01). Ippach took the opportunity to overtake Charles-Barclay between 90km and 118km on the cycle and was in first position at the 118km mark on the bike with a time of 03:42:12. In second position was Brandon (+00:24) with Charles Barclay dropping to third (+00:59). The top 3 male PRO athletes at the 141km mark were: Dreitz 03:48:22, Clavel +00:01 and Amberger +00:03. Top female PRO athletes passed the 141km mark in the following positions: Ippach, with a time of 04:14:16, followed by Charles-Barclay, who was now pushing to close the gap (+01:46), and right behind her in third position was Brandon (+01:48). The top 3 PRO men bike results were close, with Hoffman coming in with an amazing time of 04:52:43, followed by Amberger, with a time difference of 01:30, Representing Germany, in third place, was Nils Frommhold - who was behind Amberger by just one second. The PRO men’s transition from cycling to running went smoothly, with Hoffman retaining his first position and pacing himself well in the first 21.1km. Amberger followed Hoffman in second position, although he gradually slid back after the 2.9km mark. Frommhold held on to second place from 5km to 21.7km. Hoffman (06:13:32) at 21.7km was leading, as his fellow athletes, Frommhold and Dreitz, followed with a time difference of +02:03 and +03:32, respectively. It would be Hoffman’s day as he took the 2019 IRONMAN African Championship for the third time (2016, 2017 & 2019) in the time of 07:34:19. Frommhold started the run course in fourth position and showed his running prowess by finishing second overall. Austria's Michael Weiss had to work his way for his podium finish after starting the run leg in six position. “After last year I think I came here with a real fire in my belly. I wanted to show that I was back. And of course, you never know with an IRONMAN, but I knew I had good preparation. When I came back here, I felt like I was home again,” Hoffman said. In second place was Frommhold, with a fantastic total time of 07:40:12, who held it strong in the second position from the 5.7km mark up until the finish line. Coming in third with a total time of 07:42:35 was Weiss, who was made to dig deep and fight for his podium finish. 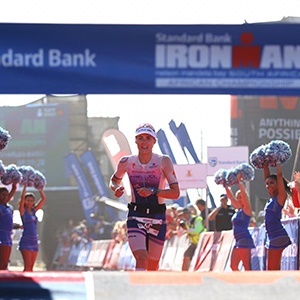 In the women’s race, the 2019 IRONMAN African Championship went to Charles-Barclay, with a total time of 08:35:31. In second place was Spain's Gurutze Frades, with a time of 08:40:47. She had the fastest run in the PRO women’s group. Doing South Africa proud in third place was Annah Watkinson, in a time of 08:43:18. Watkinson's race strategy seemed to have gone perfectly to plan.